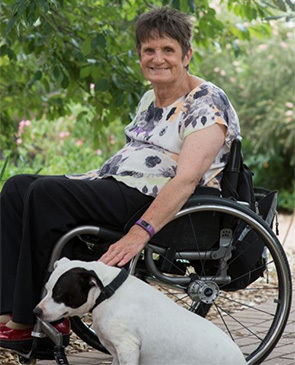 Describing her introduction to the disability sector as “arrival by surprise”, Sue Salthouse was 45 when she fell from a horse in the Snowy Mountains and embarked on her life of ‘new opportunity’ in a wheelchair. Committed to social justice, Sue’s immersion in the world of disability advocacy provided a new perspective on how to work on behalf of people who feel powerless. Considered a ‘warrior for women’, Sue’s work with disability and women’s organisations has spanned grass-roots leadership and capacity building through to ensuring women’s rights in the United Nations Convention on the Rights of Persons with Disabilities are realised. A trained teacher, Sue now focusses on women’s rights and recognition of disability. Sue is Consumer Co-chair of the National Disability Insurance Scheme expert panel in the ACT and is determined to ensure that all people with disabilities have accessible housing, economic security and are enabled to make an equal contribution to society. Sources: 2010 Friday night, I am watching a parade of exceptional women . 2015 Disability advocate named Canberra Citizen of the Year. The Canberra Times, 13 March.